The game that stimulates the brain! In my quest to keep a healthy brain, I have found success in taking my daily MEDs. MED is an acronym I created that stands for Mental Exercise Daily. Daily mental exercise will prevent you brain from atrophy and create a lifestyle to where your brain is growing in a positive direction. Below I have listed my MEDical prescription. I suggest that you do one of these brain stimulating activities (or something similar) at least once per day. Disclosure: Please do not substitute brain exercise for the lack of exercise, social activity, a healthy diet and stress management. Living an integrative holistic life is critical for have a healthy active brain. If you are into numbers you will love Sodoku. Sodoku is a logic puzzle based on number nine. There are nine main squares with each main square divided into nine more smaller squares. The main squares create a puzzle to where a series of horizontal and vertical squares are created. The level of difficulty varies each puzzle ranging from simple to downright diabolical. The level of difficulty is determined by how many numbers are pre populated in the puzzle and/or where the numbers are pre populated. Your goal is to fill in the missing numbers without repeating the same number (1 thru 9) in a main square or in a vertical or horizontal line. It sounds simple. Soduku is can be fun and nerve racking. Sodoku is a game that can be played solitaire. This is a great bonus if you want some brain exercise but you don’t have someone to play with? I have seen Sodoku games substitute the numbers (1 thru 9) with letters or symbols. I find these puzzles a pleasant change or pace when I find myself getting use to the traditional numbers based Sodoku puzzle. Without fail, you should play a word game everyday. I am an addict to a game I play on my iPhone called Words with Friends. I recommend you play the physical Scrabble game (or a similar game) in addition to the virtual game because of the face to face social interaction. I find playing word games an easy way to get-in my brain exercise. Your mind gets challenged by having to connect letters to make new words or extend existing words. Your brain will love word games because every game is changes based on the combination of words you are able to use. Spelling words provides a dual hemisphere brain exercise. Your brain has to segment a word into letters (left hemisphere) then your brain has to take the segmented letters and form words (right hemisphere). The skill of connecting to existing letters and words further enhances the dual hemisphere exercise. Full disclosure. Mind Fizzle is game I invented. Yes I’m biased, however; Mind Fizzle is mentally challenging. 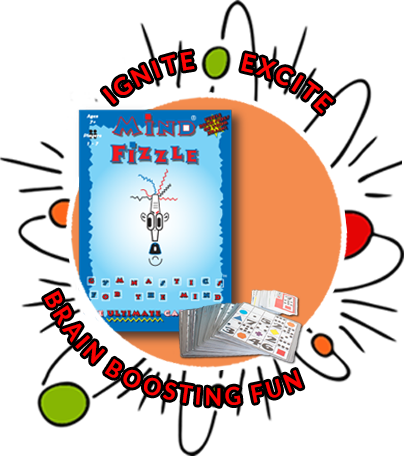 Mind Fizzle is a card game that rewards mental agility, speed, hand eye coordination, mind-brain intention and mental dexterity. You have to quickly find the missing figure (shape, color, dot or number) on the puzzle and fill in the missing figure with a card in your hand. In order to be a successful in Mind Fizzle you have to utilize/exercise both hemispheres of your brain. Colors, shapes and space stimulate the qualities of the right hemisphere of your brain while numbers, sequences and counting numbered dots utilize the qualities of the left hemisphere of your brain. The process of sorting through the cards in your hand occurs at hyper speed when competing against other players. The player to first rid themselves of their cards in their hand wins the game. I play Mind Fizzle at least twice a week. You will love this interesting brain exercise. You will find that this brain loosens up your right hemisphere of your brain. Reading a book upside down forces you to disregard logic and invites you to become more creative and playful. Simply take your favorite book or magazine and read it up side down. As opposed to reading from right to left – top to bottom, you are know reading from right to left – bottom to up. As stated before, this activity breaks up the monotony of “normal reading” and forces you to think outside the box. There have been studies that insist that moving the head from right to left activates the right hemisphere of the brain. If your a person that reads a lot of books, reports or studies, you will find this exercise remarkable. The activity of play will also have a benefit of releasing endorphins which provide a sensation of euphoric pleasure. Playing a mentally challenging game is an easy way to passively exercise your brain. Your brain will begin to make new internal neuron connections as well as reinforcing older neuron connections. Strategy, speed, hand eye coordination, anticipation, dynamic thought, etc, are fun activities your body enjoys performing. The suggestion in this blog post are only suggestions and only represent a micro fraction of this the games that can be played to stimulate your brain. The added BONUS of playing games in groups is the social interaction. As mammals, we are engineered to interact with other mammals in particular other human beings. Do yourself and society a favor and play more games.